There do not seem to be many people who just like Valentines Day, they either love it, or love to hate it. I guess I am one of the people who love it, having a Valentine or not doesn’t seem to make a difference. I enjoy trimming out little paper hearts and mailing snail mail cards. 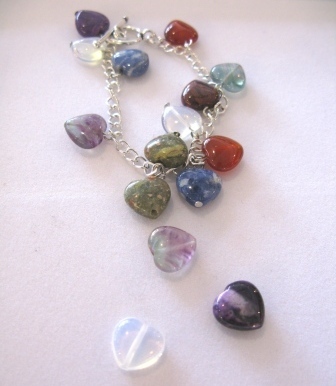 Here at the bead shop we also like making love inspiring jewelry. Here is a little charm bracelet in progress. shaped gemstone beads. I may also add a few charms.